Turkey vowed to create a "safe zone" along the Syrian-Turkish border after a phone call between US President Donald Trump and Turkish President Recep Tayyip Erdogan on Monday. The news of the zone comes a month after Trump and Erdogan spoke in December and Trump agreed to withdraw from Syria. However, it caps a month of turmoil and mixed messages by the US administration which has left US partners in Syria guessing and led to trouble in the region. "President Trump had an excellent conversation with President Erdogan and reemphasized the consistent US position on standing by the Kurds and those who fought with the US," US National Security Advisor John Bolton tweeted on Monday, after the call. 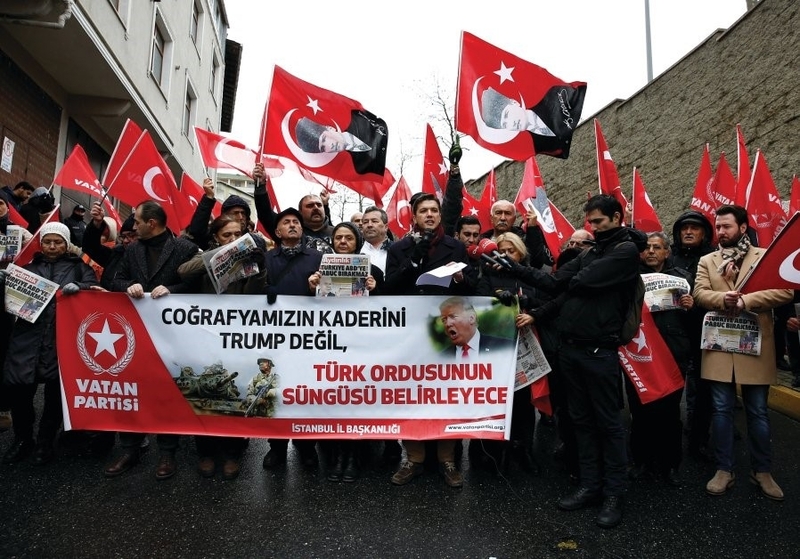 Turkey said that in the conversation Trump had reaffirmed that US troops would withdraw and that a 32-kilometer or 20-mile "safe zone" would be established by Turkey. The interpretation of the conversation, like previous discussions between the US and Turkey, appear to already be sowing questions in Ankara and Washington about exactly what a "safe zone" means. The conversation between Trump and Erdogan comes a month after Turkey vowed that it would launch an operation in eastern Syria to root out what it calls terror groups present there. This includes the People's Protection Units (YPG) which Turkey asserts is part of the Kurdistan Workers Party (PKK). The US sees the PKK as a terrorist organization but the US has been closely working with the Syrian Democratic Forces (SDF) in eastern Syria, of which the YPG is a component. Erdogan said on December 12 that Ankara was "determined to turn the east of the Euphrates into a peaceful and livable place for its true owners." He said that Turkey would not allow a "terror corridor" along Turkey's border on December 18. This came in the context of threats to attack the YPG along the border, threats Turkey has made for more than a year. In January 2018, Turkey launched a major operation in Afrin in northwest Syria to drive out the YPG. After that operation, Syrian rebel groups, some of them extremists, established themselves in Afrin and Kurds have complained of abuses. Kurds in eastern Syria, who make up the bulk of the YPG and SDF fighters who have defeated ISIS alongside the US-led coalition, don't want another Afrin to happen in eastern Syria. Trump's decision on December 19, made after a December 14 call with Erdogan, shocked the Kurds in eastern Syria. They have sought discussions with Damascus, Cairo and Moscow to see who will step into the vacuum left when the US withdraws. Trump's advisers were also concerned. Secretary of Defense James Mattis and anti-ISIS envoy Brett McGurk resigned over the decision. That has left Secretary of State Mike Pompeo and Bolton to shore up US allies in the region and work out the Syria withdrawal mess. Pompeo warned in early January that the US would not allow the Kurds to be slaughtered in a Turkish operation. Bolton visited Turkey on January 8 vowing to tell Ankara not to attack US Kurdish partners in eastern Syria. Instead, Erdogan refused to meet Bolton, widely seen as a snub. Turkey said that the US was casting aspersions on its treatment of Kurds. Erdogan said that those who make such claims are not familiar with the facts on the ground in Syria and that Turkey wanted only to ensure security in Syria and to fight terrorism. While US advisers to Trump have sought to slow down the withdrawal and make sure that US partners who played a central role in defeating ISIS are protected, the Trump administration has appeared to reverse course again and again on its Syria policy. Although the administration says it is leaving it also has now vowed to stand by the Kurds. It also continues to want Iran to leave Syria. Pompeo's visit to the region was aimed at confronting Iran and he said in the UAE that he was optimistic an agreement could be reached with Turkey. The latest US-Turkey discussion about a 32 km.-buffer zone or "safe zone," as Turkey calls it, has left more question marks. If Turkey seeks to push into eastern Syria and secure a swath of territory along the border, most of the major Kurdish populated areas will be occupied by Turkish forces in such an operation. This is because most of the Kurdish population lives along the border with Turkey. How can the US come to an agreement which enables a Turkish operation to create a "safe zone" while preventing fighting between Turkey and the YPG or SDF? Turkey says that the US has affirmed that it supports this safe zone plan. This once again shows that Washington and Ankara appear to diverge on basics of how a Turkish operation will unfold. What happens in eastern Syria has larger regional consequences. The Syrian regime will seek to return to the areas from which the US withdraws. Moscow will want to broker that return as Moscow has done in southern Syria and Idlib. This sets up a potential embarrassment for Washington as Russia becomes the arbiter over dividing up the spoils left behind by Washington. Moscow will look like the cautious and reliable partner to Turkey, Syria and Iran, as it has been at peace talks in Astana, Sochi and Geneva, while the US appears to have a policy that lacks clarity. Israel's views matter here as well. Bolton visited Israel before Turkey and Pompeo's Cairo speech underlined the importance of confronting Iran. Jerusalem has been speaking more openly about its operations against Iran in Syria. Israel wants Iran to withdraw from Syria, but the US withdrawal potentially enables Iran to grow its influence, not shrink its power in Syria.